Known to those in the know as "The Full Charge," Matt Fulchiron hardly lives up to his nickname. Worn down by relationships, adult responsibilities, and limited resources; Fulchiron coasts through his life and his act with a sarcastic and defeated outlook. 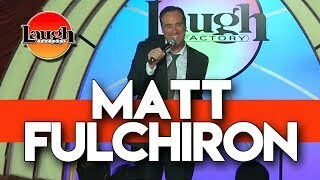 Matt has performed on the television shows "Comedy Central Presents," "Live at Gotham," "The Late Late Show with Craig Ferguson," "Last Comic Standing," "Tosh.0," and "Comics Unleashed." He's appeared on The Bob and Tom Radio show, and was the opening act on Daniel Tosh's "Tosh Tour Twenty Ten." He currently lives in New York City where he wrecks microphones on a nightly basis.